Classic and sports car storage. Holmes motor company. Ltd. are now able to offer your treasured car a place within our secure, clean and dry storage facilities. We are based in the heart of the U.K-south west-midlands in rural Gloucestershire and have good access for all methods of vehicle transportation. Our tariffs cater for simple short term storage or long term preservation storage, with or without maintenance programs. We can offer a complete cleaning service which includes the removal of all harmful residues and the application of specialist protective coatings to vulnerable parts ensuring maximum preservation. You have the option to choose from one of our standard storage programmes or if you require that little extra for your treasured vehicle we will tailor a maintenance package to suit your vehicles requirements. This may include regular starting and warming through of the engine, regular rotation of the wheels, battery maintenance etc, as frequently as required for your peace of mind. For cars “in use” we can clean, maintain and service your car ready for its next outing. 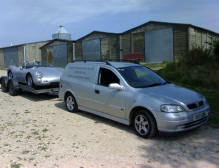 Collection and delivery can be arranged either by trailer or driven. A full listing of all standard tariffs is available below, should you have any questions or would like to arrange a placement for your car please do not hesitate to Contact us. Standard secure, clean, dry storage inside: £59.50 pcm. Long term active storage: £79.50 pcm. Car mounted on axle stands. Engine run every 30 days to normal temperature. All systems operated, electric motors, window mechanisms etc. Clutch and all gears are engaged driven wheels rotated gently through transmission. Non-driven wheels rotated by hand. The brake pedal is applied to generate pressure and movement in the system. A visual inspection is then made and a report compiled. Rental of battery conditioner £2.50 p\w. Our normal labour rate for service and maintenance is £30.00 p\hr. A 20% storage discount is applied after 6 consecutive months. If you prefer we can arrange the relevant cover on your behalf at favourable rates. being deposited at our premises and quarterly thereafter. Minimum term 1 month, full refund pro-rata on complete unused months. Pictures coming soon, please check back at a later date.